Lugging a plastic bag carrying the clothes and food scraps she could salvage, Umm Samir set out from her ruined home and crawled through the pre-dawn gloom on her second journey into exile in 68 years. In the difficult days since, she has made her way from the YarmoukPalestinian refugee camp in Damascus to Beirut, where she now confronts the bitter reality of again becoming a refugee, the lifelong dream of returning to her birthplace now further away than ever. Across the room, Umm Samir’s daughter, son-in-law, and five of their 10 children, were squatting silently on the floor. The children’s father, Abu Sameer, had a hunched and defeated air, while their mother, Umm Sameer, shifted quickly between anger and sorrow. Over the past fortnight, the siege of Yarmouk, the camp held up by Syriaover four decades as a symbol of its commitment to the Palestinian cause, has reached a nadir. Many of those who remain have been unable to eat, or leave. Others, like Abu Sameer and his family, decided that a suicide run for the camp’s closely guarded borders was a better bet than fossicking for scraps in abandoned buildings and pillaged orchards. The desperate plight of those who left behind was showcased last week through pleas by the United Nations Relief Works Agency (UNRWA) and stories in the Observer. Both revealed the scale of an unfolding catastrophe starkly at odds with a recent UN security council resolution demanding that humanitarian aid be delivered to all those caught up in Syria’s unrelenting war. Last week, after a demand from UN secretary general Ban Ki-moon, things changed in Yarmouk, with food parcels reaching some of those who needed them for the first time in 15 days. The UNRWA reported that Syrian officials had allowed close to 700 parcels, each capable of feeding between five and eight people, into the camp. The delivery eases an immediate crisis, but fails to address a profound stockpile deficit caused by months of delayed deliveries earlier in the year. Many of the Yarmouk exiles say the name of their former home will soon be etched into infamy in the same way that Sabra-Shatila was 32 years ago, when more than 1,000 Palestinians were massacred by Lebanese Christian militias who at the time were allied to the occupying Israeli army. The ghosts of 1982 remain deeply synonymous with Palestinian suffering. But some of the new arrivals say the scale of the current horrors in Yarmouk and other Syrian camps may soon eclipse even such a painful episode. 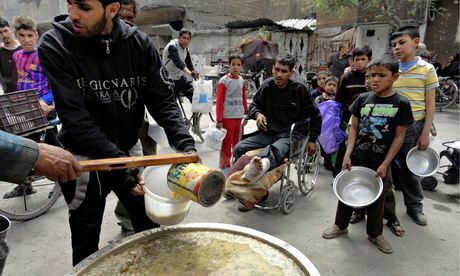 Unwanted in Syria, those fleeing Yarmouk are hardly made to feel at home in Lebanon either. New arrivals are given a one-week visa, which requires them to report to authorities or face a $200 fine, which few among them can afford. While UNRWA and other aid organisations offer some food assistance and living space, conditions are far worse here than in pre-war Syria. Outside Sabra-Shatila, in the Palestinian embassy nearby, senior official Qassem Abbas, who is responsible for Yarmouk arrivals, tried to play down the scale of the crisis. “Things have actually improved in recent weeks,” he said. “They haven’t worsened. The Palestinian leadership has decided to take a position of neutrality. This brought us closer to the Syrian regime, despite everything that has happened. It was a difficult decision, but it made us less biased.